The SA 330 Puma was originally developed by Sud Aviation to meet a requirement of the French Army for a medium-sized all-weather helicopter. The helicopter also had to be capable of operating by day and night as well as in a wide variety of climates. In 1967, the Puma was also selected by the Royal Air Force (RAF) and given the designation Puma HC Mk 1. As a result of this decision, the SA 330 was included in a joint production agreement between Aerospatiale and Westland Helicopters of the UK, which also resulted in the purchase of Aérospatiale Gazelle by the United Kingdom and the Westland Lynx by France. This resulted in Westland building components for the Puma, and assembling the RAF's Pumas. The first of two Puma prototypes flew on 15 April 1965. Six pre-production models were also built, the last of which flew on 30 July 1968. The first production SA 330 Puma flew in September 1968, with deliveries to the French Army starting in early 1969. Production of the SA 330 Puma by Aérospatiale ceased in 1987, by which time a total of 697 had been sold. 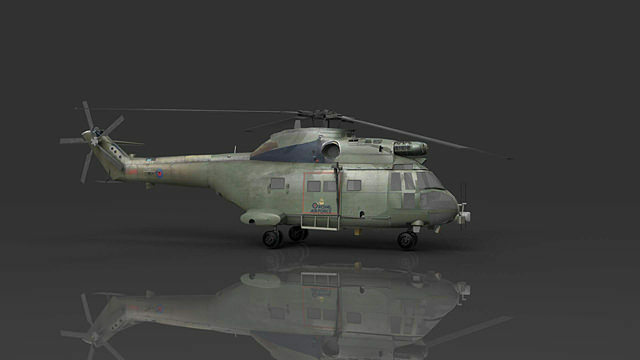 The Puma was then replaced by an upgraded and improved version, the Eurocopter AS332 Super Puma. This model is a faithful replica of the original fully detailed and parts separated for easy animation use.